E-readers are now mainstream. It’s no longer a surprise to see someone next to you whiling away an hour or two – in the queue in York post office to buy a stamp, perhaps – with a Kindle or Kobo. And for the everyday cyclist, the e-reader is a pannier essential: unlimited, lightweight, space-efficient reading matter to pass the time with that riverside picnic, or waiting for the red light on Clifton Moorgate to change. Addressing just this sort of situation is Bicycle Reader (picture), a periodical e-magazine curated by cycle journos Jack Thurston (of the Bike Show) and Tim Dawson (a Sunday Times Cycle Guy columnist), which aims to assemble the best in new and classic thoughtful writing about bikes: essays, extracts, articles, opinions. In the first issue, Summer 2012, Jack’s Up and Tim’s Down (yes, about climbs and descents, which requires a bit of imagination in the Vale of York’s ironing-board topology) frame eight diverse pieces. There’s Mark Twain’s sardonic 1884 account of learning to ride a ‘penny-farthing’. It’s known chiefly for its conclusion (“Get a bicycle. You will not regret it, if you live.") so it’s nice to discover its quotable, period-portrait entirely (“If you try to run over the dog he knows how to calculate, but if you are trying to miss him he does not know how to calculate, and is liable to jump the wrong way every time."). Gentle, bygone-era travel pieces from Violet Paget (posh continental picnics) and Albert Winstanley (back-lane exploration of the Trough of Bowland) complement fresh writing about car-free living in LA and bike politics in Washington DC. A polite-but-passionate Victorian debate about wheeling issues (Cyclomania) contrasts with Paul Lamarra’s absorbing exploration of the unheralded Scotland just off the M74. 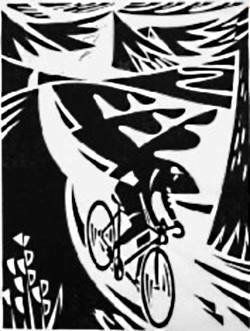 The most fascinating item is probably Martin Ryle’s Vélorutionary, a philosopher-cyclist’s view of the bike’s role today that was previously seen only in a niche journal, Radical Philosophy. Biking helps us all think - Sir Bradley himself has said how much his time in the saddle has helped him work things out in his head – but while we fete the professional cyclist who can think a bit, it’s good to celebrate the professional thinker who cycles too. Though the question I usually mull over as I cycle home from the post-Mystery-Play- Rehearsals pub session is how to best stay upright. But this is a collection worth not just reading but re-reading – thinking stuff ideal for chewing over in that leisurely sandwich break or unwanted train delay. At the price of two packets of pub crisps it’s good value, and I look forward to the second edition later this year.